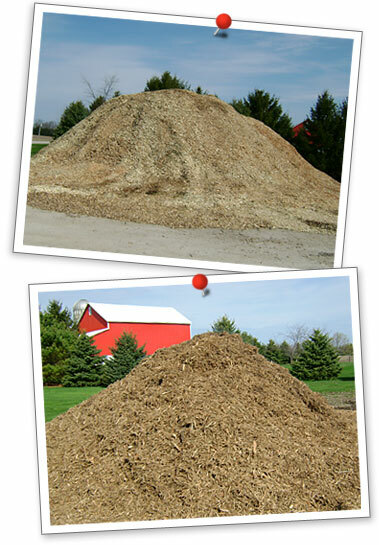 Mulch / Woodchips | Abler Tree LLC. Mulches are materials placed over the soil surface to maintain moisture and improve soil conditions. Mulching is one of the most beneficial things a homeowner can do for the health of a tree. Mulch can reduce water loss from the soil, minimize weed competition, and improve soil structure. Properly applied, mulch can give landscapes a handsome, well-groomed appearance. Mulch must be applied properly; if it is too deep or if the wrong material is used, it can actually cause significant harm to trees and other landscape plants. Mulch serves as nature's insulating blanket. Mulch keeps soils warmer in the winter and cooler in the summer. Some mulches can improve soil fertility. (Ours is one such mulch since it is all natural without any preservatives). Mulching around trees helps facilitate maintenance and can reduce the likelihood of damage from "weed whackers" or the dreaded "lawn mower blight." Mulch can give planting beds a uniform, well cared for look. Wood chips: Byproduct from our wood chipper from tree pruning and removal. They are a medium-sized solid material great for mulch! Shredded Mulch: All wood byproduct created from a tub grinder. This is shredded wood finer than wood chips for a more finished look. Copyright ©2019 Abler Tree Company LLC All rights reserved. Website development by wisnet.com.